Lily Zubaidah Rahim lectures on Southeast Asian Politics and Political Islam. The Singapore Dilemma: The Political and Educational Marginality of the Malay Community, (KL: Oxford University Press, 2001) established her as a leading researcher on political and social developments in Singapore. The book precipitated a public debate on Singapore’s nation-building paradigm and has been translated to the Malay language by the Malaysian National Institute for Translation. Building on the themes in The Singapore Dilemma, her second sole-authored book Singapore in the Malay World: Building and Breaching Regional Bridges (London: Routledge, 2009) focuses on Singapore’s mercurial relations with neighbouring Malaysia and Indonesia. A third book, Muslim Secular Democracy: Voices From Within (NY: PalgraveMacmillan) explores the trajectories and varieties of secularism in the Muslim World. She is currently engaged in a global project on democratisation and secular states in the Muslim World. An earlier team project funded by an ARC Discovery Grant (2003-2006), led to the publication of an edited book entitled ‘Paths Not Taken’, published by the National University of Singapore Press (2008). A Singaporean national, Lily Zubaidah’s international exposure includes extended periods of teaching and research in Malaysia, Singapore and The Netherlands. She presented a paper on indigenous minorities in Southeast Asia at the historic UN Conference on Racism and Public Policy in Durban, South Africa and has been commissioned by the UN Office of the High Commissioner for Human Rights in Geneva, to prepare a report on ethnic minorities in Singapore and Malaysia. She has also been engaged by the Asia-Europe Foundation as a consultant on ethnic tensions and inter-faith dialogue in Asia. 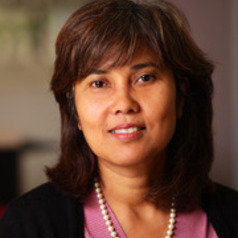 Lily Zubaidah is currently President of the Malaysia and Singapore Society of Australia (MASSA) and Convenor of the 2013 MASSA symposium, to be held at the University of Sydney. She is also Convenor of the Religion, State & Society (RSS) Network at the University of Sydney. The RSS network is organising an international symposium entitled ‘Competing Vision in the Muslim World’ in August 2013. Her multidisciplinary research interests have been published in numerous international journals and book chapters. They include an eclectic range spanning from governance in authoritarian states, democratisation, development, ethnicity, regionalism and political Islam.